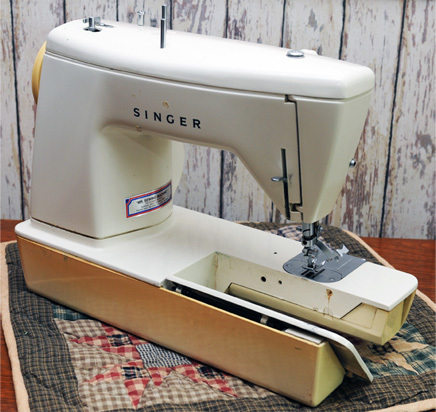 We purchased our Singer Model 6705 Graduate at the French City 500 Flea Market during July 2009. We had no knowledge of the Graduate model when we purchased it. However, an Internet search led us to believe that Graduate machines are designed to be used in school systems. The image above shows our Graduate with the free-arm exposed. 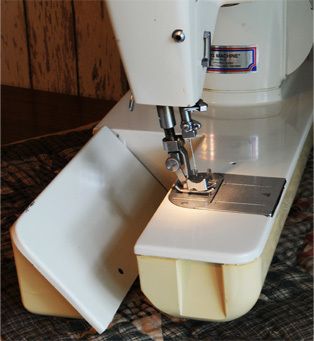 The door on the machine base easily lowers to make the conversion. The machine has an internal motor permitting a streamlined design. 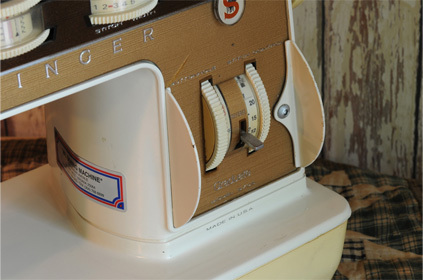 The label on the machine was placed there by a Service Center in Dunbar, West Virginia. The image above shows several unique features of the Graduate. First, there is a screw in the faceplate that prevents students from opening the door and making adjustments to the presser foot tension. The image above also shows the slant-needle. Also, note a guard surrounding the needle to prevent little fingers from being pierced by the needle. The image below shows the needle guard rotated out of place so the needle can be threaded. The machine works with the guard up or down since it is attached to the presser bar. The image at left shows sequence the of threading this Graduate machine. 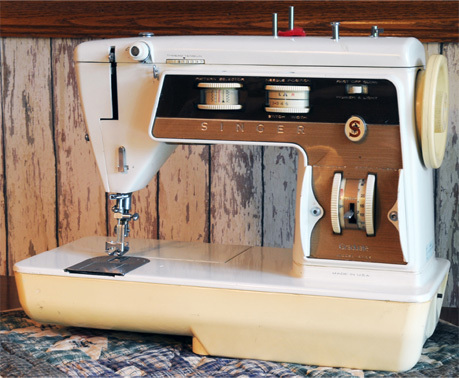 To aid in teaching threading, the number 1 is on the first thread guide; the number 2 is on top of the tension disk; and the number 3 is by the take-up spring. The image above shows another unique feature of the Graduate. Fins protect the Stitch Length selector. We haven't figured the big reason for this, but are certain schools have one. Controls on the Graduate are straightforward. The top right slide-switch selects either high or low speed and turns off the machine--selecting a speed turns on the machine. 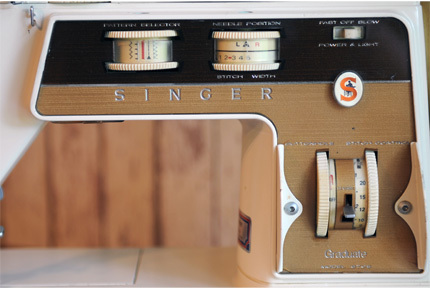 The top-left thumbwheel selects one of five built-in patterns. 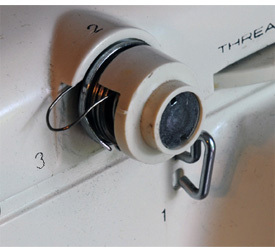 The top-right thumbwheels control both needle position (the top half) and stitch width (the lower half). 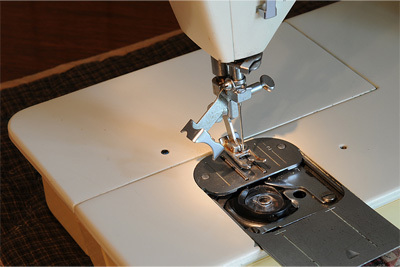 The left-vertical thumbwheel selects buttonhole functions and the right-vertical thumbwheel selects stitch length. We don't have a manual for our Graduate so are learning how to use it as we go. Another oddity we have noticed about our Graduate is the power cord. First the cord is a very heavy 3-conductor wire and the plug-in has a heavy-duty 3-prong connector. Our graduate was made in U.S.A.